Many of us that grew up in the Copper Country probably never knew the history behind the canal and how important it was in the early days of mining. 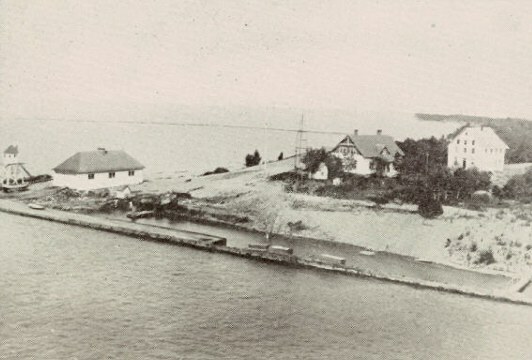 In 1865, at the end of the Civil War, the US Government awarded the Portage Lake and Lake Superior Ship Canal Company an initial grant of 200,000 acres of mineral land in return for the construction of a canal through the Keweenaw. This first land grant was used to secure the issuance of fund-raising bonds required to pay for all design, management and construction costs. 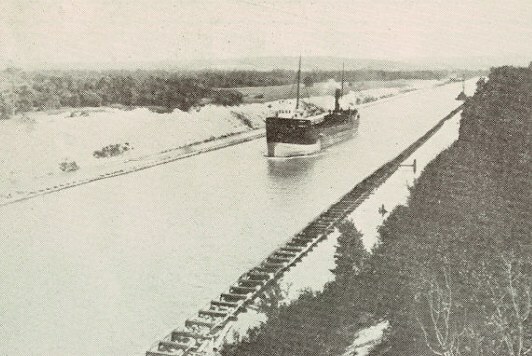 The canal was intended to connect Keweenaw Bay (on the East) through Portage Lake into Lake Superior (on the West). This would save lake vessels over a hundred miles of distance as they traveled through the Keweenaw and into other lake regions. Due to poor financial management and planning, the original company was bankrupted. 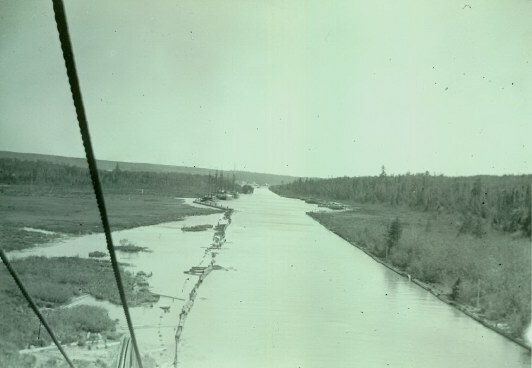 The Government eventually granted a total of 450,000 acres of land over the next several years to help support the project, and by 1874 the canal was finally completed by the Lake Superior Ship Canal, Railway and Iron Company. By 1882, the use of the canal was generating $8,000 in annual income. The actual canal was two miles long, 100 feet wide and 14 feet deep. The project also included improvements to the Portage River through the straightening, widening and deepening of its course. 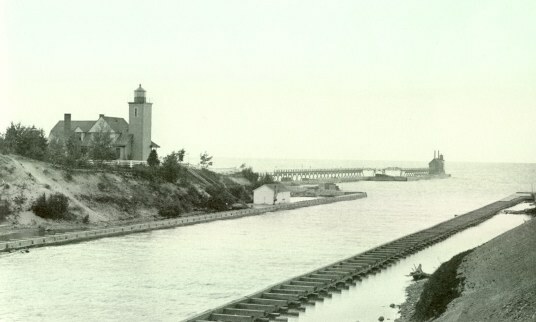 The canal was widened to 500 feet in 1935. Today, the canal's importance has been reduced. Rarely do you see a large commercial ship pass through. But it played a very important function for many years and contributed untold amounts of economic gain for the mines and communities of the Keweenaw. 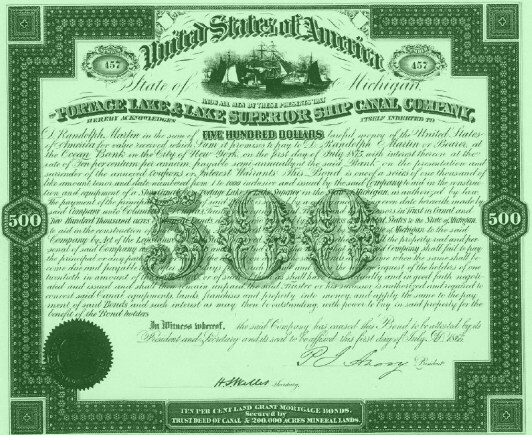 Original 1865 Bond issued to construct the canal and backed by 200,000 acres of mineral land. 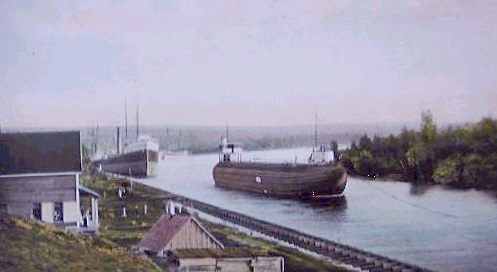 View of the canal with ships in dock at the wider section. One of the many ships that used the canal to save time and money. You can see the pilings that identified the proper width of the canal. 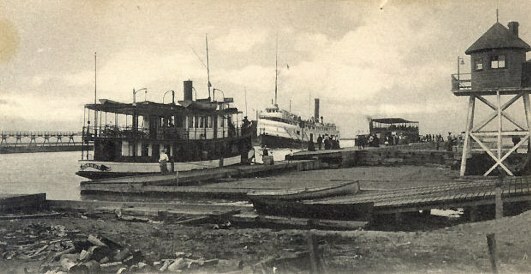 The vessel on the above right (in background) is the passenger barge "Pilgrim", used to haul, by towing, people to the recreation area at White City. The "Pilgrim" had a bar and dance floor on the main deck. Thanks to Don Nelson for this information. The ship below is an early iron ore ship known by its unique design as a "Whale back". 500 feet. 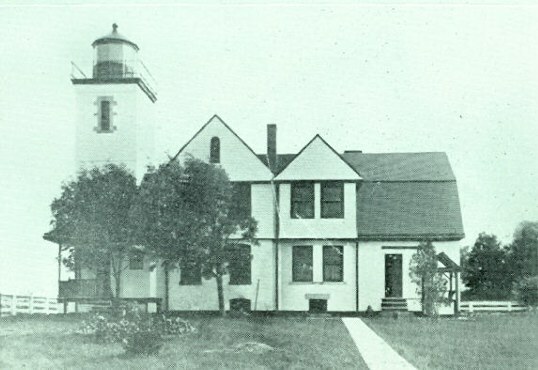 A view of the original 1874 lighthouse on the South side (below). Thanks again to Don Nelson. 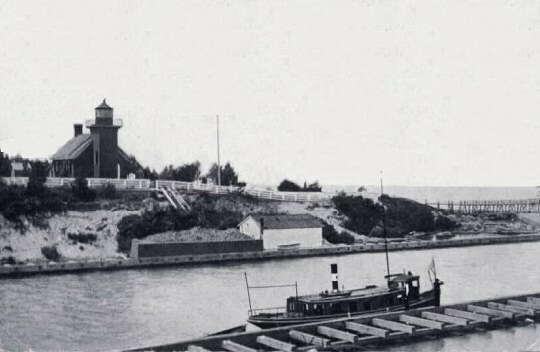 Another view of the original 1874 lighthouse (above). This was torn down in 1935 when the canal was widened.